My apologies if you've come to my blog more than once to see the same post. My mom arrived on Sunday night, and I've been completely focused on getting Jace well, cleaning my house, and getting some work done. Jace is doing way better. His face in this pic makes me laugh. It pretty much says what we were all thinking about that oxygen. I took this one beautiful, sunny day when he was stuck inside. Props to my chiropractor who adjusted Jace the Tuesday after he was released from the hospital. Jace was honestly a different child after the adjustment. Our pediatricain, who is a personal friend and we love him, said Jace would have a cough for about 2 weeks after we left the hospital. Jace hasn't had a cough, sniffle, sneeze or fever. It's pretty amazing. Thanks again for all the prayers and support. Jace has been off oxygen for a week. 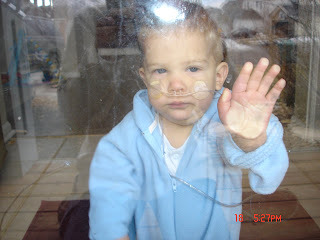 he looks like the "boy in the bubble" I'm glad he's better! Hope he is stronger from this. Ohhhh, I just want to reach through the screen and hug him! We took Annika to the chiropractor when she was a baby, I totally believe in that. I'm glad he's doing better. You are such a good writer! Thank goodness you blog cause I just don't talk to you enough to know what is going on, but I do check up on your blog often to get the recent stories, pictures and updates on your family. Glad Jace is doing better! You are all in my thoughts and prayers regularly. You are such a blessing to eachother. That cute little face looks familiar. Connor is just a wee bit smaller with the tubes in his nose! Pray that he gets off the O2 tomorrow!